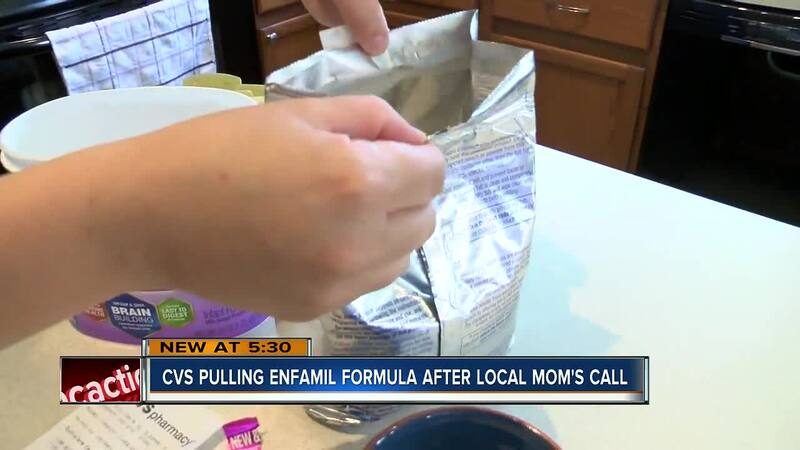 PINELLAS COUNTY, Fla — CVS has pulled all powdered Enfamil baby formula off its shelves as its pharmacy department does an internal review. This comes after a local mom shared her story with ABC Action News about what she found inside a tub of formula she bought last week. This has been reported in other states around the country - a woman was even arrested in Tucson after she was found guilty of swapping baby formula with flour at stores in that area, including two Walmart’s. After ingesting the tampered formula, one baby got sick but is doing ok now, according to AP. Enfamil says there is no recall on any of its products. Enfamil encourages anyone that purchases its products to check the appearance of the package - even differences that may be minor could be meaningful. If you’re ever unsure you can call their hotline at 1-800-BABY123.